As more and more conference and meeting planners trade separate session rooms and scattered ballroom spaces for open “campuses” where content, networking and entertainment take place in one room, speakers and attendees may find themselves needing to speak up—unless, of course, the conference has embraced the next generation of audio solutions. 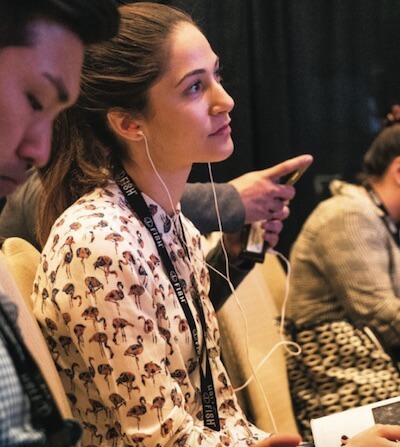 Enter the digital infrared language distribution system, an audio solution provided by Conference Rental, that delivers crystal clear sound to attendees via headphones based on their location on the conference floor. Conference Rental activated this solution at EventTech 2015 in Las Vegas, an open-campus-style technology event that offered six simultaneous Learning Labs in each corner of the room and a buzzing demo expo in the middle. Attendees simply tuned in to the Lab they wanted to join and listened in on a pair of complimentary headphones. Originally developed for language interpretation with its multi-channel capabilities, infrared language distribution, or IR technology, is especially useful in conference or tradeshow environments because it is immune to interference from Wi-Fi or other devices and frequencies. It uses light to transmit signals as opposed to radio frequencies (which can also result in rougher audio). Intrigued? Well, listen up. Here, we take a closer look at the technology and how it can transform the attendee experience. An audio source (music, voice from a microphone) is connected to a main box called an IR transmitter that can handle up to 32 channels of audio simultaneously. From that box, the audio is transformed and modulated into a digital infrared signal. That signal is then emitted from what are called infrared radiators or simply “emitters.” Essentially, it’s a panel on a tripod covered with LED lights that radiate that infrared signal into up to about 150-square-feet of space (multiple radiators can be connected for more coverage). Attendees wear receivers (clipped to a pocket, belt or bag) that have a channel selector and volume control. If they leave the zone that the emitter is positioned for, the signal will no longer work. At EventTech, IR transmitters were placed in each Learning Lab connected to that Lab’s audio source. With headphones in place, attendees would only hear that Lab’s speaker presenting, and could adjust the volume as desired. Depending on the type of show, there are other setups available. “We can also fill the entire room with the emitter panels in 32 different channels, so it doesn’t matter where you’re sitting, you can tune into whatever channel you want by adjusting your receiver,” Murphy says. You’ll need a station or designated booth to hold the receivers, their charging stations for registering attendees and distributing the receivers. You’ll need to determine what “zones” you need audio for and how many emitter panels will be required to cover that zone. You’ll work with your A/V vendor who’ll provide microphone systems that interface with the IR transmitter. And finally, you might consider providing headphones for your attendees. At EventTech, organizers handed out branded ear buds that attendees could use and take home. “It’s a nice extra marketing or sponsorship opportunity if you want to provide these and include a company logo on them,” Murphy says. Attendees could also wear the headphone of their choice. Think Silent Disco, conference-style. Interpretation: You can support an international audience in one room with multiple language channels simultaneously, and live. Assistive Listening: This solution can serve audience members who are hard of hearing. Trade Show/Tours: Exhibitors might leverage this solution since many shows prohibit them from amplifying audio within booths. Museums often use this type of solution for guided tours that won’t overwhelm the room. Media Centers: Think sports bars with multiple TVs broadcasting competing games. Overflow Crowds: By placing an emitter in an overflow area, everybody can listen in live and clearly to a main stage event. This can be especially useful for events involving a pressroom and a highly publicized keynote or announcement. Secure Meetings: This solution is inherently secure from eavesdropping, since the light does not pass through surfaces, like walls, keeping meeting data confidential by only allowing individuals inside the room with headphones to listen in. As far as how many folks can tune in via this system— there are no limitations. You can have limitless emitter panels—technically, an infinite number of people could tune in so long as they are in the IR coverage area. As far as audio sources, right now, the technology handles a maximum of 32 channels per transmitter (with a 40- channel solution soon to hit the market). Only challenge: communicating to attendees that the receivers they wear must not be covered or placed in a bag so that they’re detected by the site-line of the emitter panel. It depends on how many people need receivers and how many different audio sources you’ll have or how large the venue is you’re trying to cover with a signal. The larger the space, the more emitter panels you may need. If you’re taking a zoned approach like EventTech’s Learning Labs, you’ll need more transmitters. The cost may vary per case, but one thing is clear: your audio.